Nov. 27, 2013: Astronomers have long been puzzled by a certain meteor shower. Every year in mid-December the sky fills with flashes of light shooting out of the constellation Gemini. The Geminids are fast, bright, and reliable. They never fail to show up and many observers count them as the finest meteors of the year. But where do they come from? That is the puzzle. Meteor showers are supposed to come from comets, yet there is no comet that matches the orbit of the Geminid debris stream. Instead, the orbit of the Geminids is occupied by a thing called "3200 Phaethon." Discovered in 1983 by NASA's IRAS satellite, Phaethon looks remarkably like a rocky asteroid. It swoops by the sun every 1.4 years, much like a comet would, but it never sprouts a dusty tail to replenish the Geminids. "A rock comet", says Jewitt. A rock comet is, essentially, an asteroid that comes very close to the sun--so close that solar heating scorches dusty debris right off its rocky surface. This could form a sort of gravelly tail. Indeed, in further STEREO observations from 2009 and 2012, Jewitt along with colleagues Jing Li of UCLA and Jessica Agarwal of the Max Planck Institute have spotted a small tail sticking out behind the "rock." "The tail gives incontrovertible evidence that Phaethon ejects dust," says Jewitt. 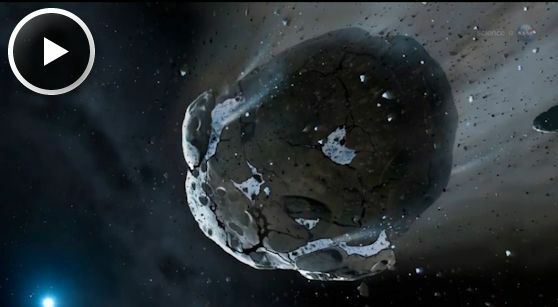 Jewitt's team believes that the dust is launched by thermal fracturing of the asteroid’s crust. A related process called “desiccation fracturing”--like mud cracks in a dry lake bed--may play a role too. 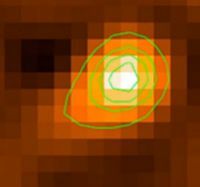 Seeing 3200 Phaethon sprout a tail, even a small one, gives researchers confidence that Phaethon is indeed the source of the Geminids--but a mystery remains: How can such a stubby protuberance produce such a grand meteor shower? Adding up all of the light STEREO saw in Phaethon’s tail, Jewitt and colleagues estimate a combined mass of some 30 thousand kilograms. That might sound like a lot of meteoroids but, in fact, it is orders of magnitude too small to sustain the massive Geminid debris stream. Continued monitoring by NASA's STEREO probes might one day catch the rock comet spitting out a shower of dust and debris, solving the mystery once and for all. Until then, it's a puzzle to savor under the stars. This year's Geminid meteor shower peaks on the nights of Dec. 13-14 with dozens of “rock comet meteors” every hour. Bundle up and enjoy the show.